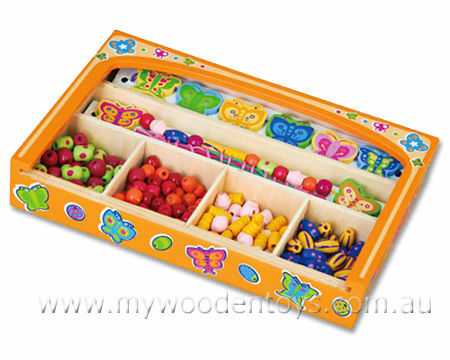 Butterfly Bead Lacing Set is a beautifully pretty beading set with over 175 lovely multi coloured wooden beads decorated with stripes and spots. This lovely toy will help you create some lovely necklaces and bracelets. It also contains eight painted butterflies with unique patterns. There are also plenty of coloured laces so you can create to your hearts content. The set comes in a painted box with a sliding perspex lid containing six compartments so everything can be kept in it's place. Material: Wood with Child safe paint and cotton laces. We like this because: "A beautiful toy to encourage your little ones creativity."